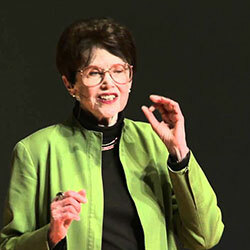 Riane Eisler is the author of The Chalice and The Blade: Our History, Our Future in which she introduces the cultural transformation theory and the partnership and dominator model of human possibilities. Her newest book is The Power of Partnership, which applies the partnership model to day-to-day life and work. She is also the author of Tomorrow’s Children, Sacred Pleasure, Dissolution, and The Equal Rights Handbook and the co-author of The Partnership Way and Women, Men, and the Global Quality of Life. She has also written over 100 essays and articles for publications ranging from Futures, Behavioral Science, Holistic Education Review, and Political Psychology to The UNESCO Courier, The International Journal of Women’s Studies, the Human Rights Quarterly, and the World Encyclopedia of Peace. Dr. Eisler was recently honored as the only woman among twenty great thinkers including Vico, Hegel, Spengler, Adam Smith, Marx, and Toynbee featured in Macrohistory and Macrohistorians, in recognition of the lasting importance of her work. She is President of the Center for Partnership Studies which was founded to further partnership relations. To read more about Dr. Eisler, visit her personal site. We are a nonprofit think tank and action incubator that explores the role of business in relation to critical moral, environmental, and social issues of our time. Keep up with The World Business Academy. Follow us across our social networks.